When you’re looking for the best cat litter, consider your cat first. With “inappropriate elimination” near the top of list of reasons cited when people relinquish their cats to the animal shelter, it’s clear that a harmonious litter box situation spells happiness in a cat-inclusive home. If you look at it from your cat’s perspective, you’ll have a good foundation for evaluating the litter box arrangement. Is the litter box clean? Spacious? Is dust filling a hooded box and choking your cat? Is the Mango Aloha scent overwhelming? 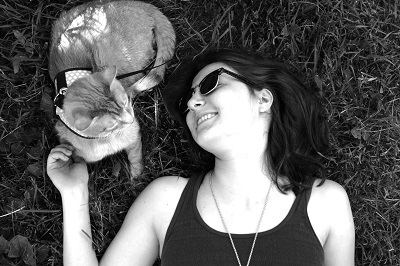 Once you’ve satisfied your cat’s needs, you can start considering your own. Humans deserve a comfortable home, too, and the ideal litter box benefits both you and your cat. Prior to the invention of the kitty powder room, cats did their business outdoors, where soft earth is sometimes hard to find and predators may stage a bathroom break ambush. Thanks to the litter box, your cat can find relief in peace. Instead of forcing our cats to use a human toilet, we give them a soft substrate that mimics the dirt and sand they’d use in the wild. 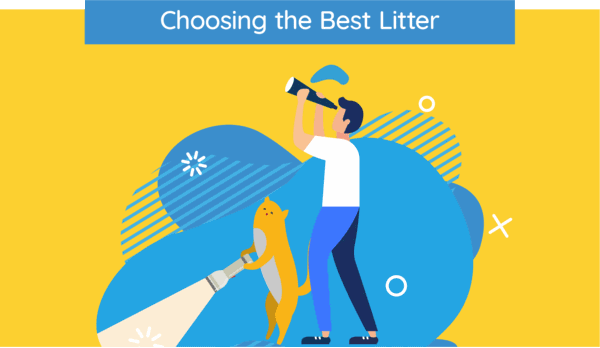 Your cat’s natural instincts get the respect they deserve and the litter helps to control the smell and appearance of cat waste in the house. The cats win. The humans win. And any cat litter that contributes to this situation is a winning product. 1. The best cat litter creates solid clumps that are easy to scoop. Both cats and people prefer clumping litter. It’s easy to clean and promotes a dry, comfortable environment. Not all clumping litter works equally well. Some products create soft blobs and others yield firm urine rocks. You don’t want to feel like you’re scraping chunks out of a bowl of cookie dough. The clumps should be cohesive, firm, and easy to remove. If your litter creates loose, crumbly clumps and leaves chunks of waste behind every scooping, think about finding a better litter. Move on to another product that creates firm, beautiful clumps. 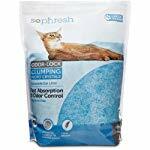 Click here for a list of the best clumping cat litter on the market. 2. The best cat litter controls odors well. The best cat litter helps to keep odors at bay – but don’t expect a box full of clay granules to take over your job. Many cats avoid the litter box because it’s not clean enough for their standards. And only you – and the other humans in the household – can control that. Click here for a guide to eliminating litter box odor. 3. The best cat litter is low-dust. Most litter is advertised as low-dust or “99% dust-free”, but these are flimsy claims. Some so-called low-dust products create plumes of dust, so don’t trust the label. Read customer reviews instead. Click here for a guide to best dust free cat litter. 4. 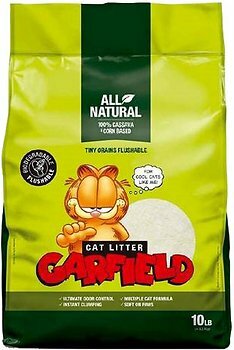 The best cat litter is affordable. 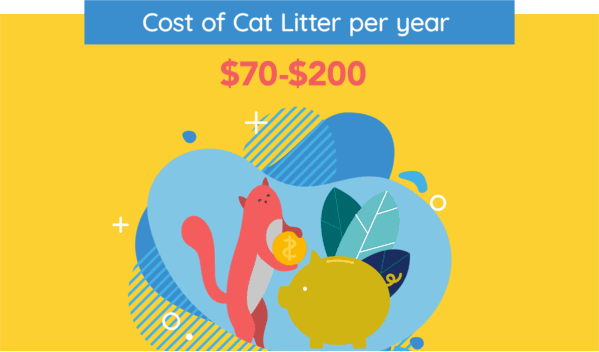 Depending on what type of litter you choose, you could end up forking over $70 – $200 per year in cat litter expenditures. That may not sound like a money to you, but when you consider that a human’s annual toilet paper expenses are low as $15 and usually don’t exceed $50, cat litter starts to look a bit spendy. Don’t think that you need to choose expensive litter box filler. The most affordable litter is often the best, and you might be better off using soil from your backyard than spending big bucks on premium litter. Many cat litter shoppers explain that they save money by buying cat litter in bulk or from store brands like Chewy’s Frisco and Petco’s So Phresh. 5. The best cat litter doesn’t track excessively. Litter tracks. It gets trapped in your cat’s paws and fur and hitches a ride out of the litter box. Although many litter companies call their products “low-tracking”, the best way to control tracking is by investing in a good litter mat. Secondly, consider using dense litter with heavy granules. 6. The best cat litter is made without irritating fragrances. Some people prefer litter made with added perfume, but these fragrances only encourage lazy litter box management and may irritate your sensitive cat. 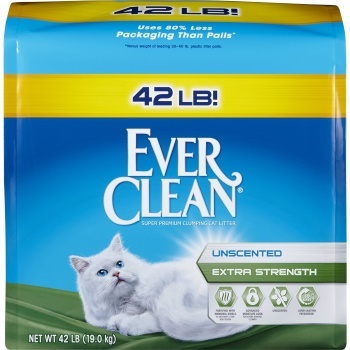 The best cat litter doesn’t lean on fragrances to disguise the smell of cat waste. Click here for a guide to best natural and organic cat litter. Today’s cat litter shopper has the privilege and challenge of dealing with an astounding product variety. 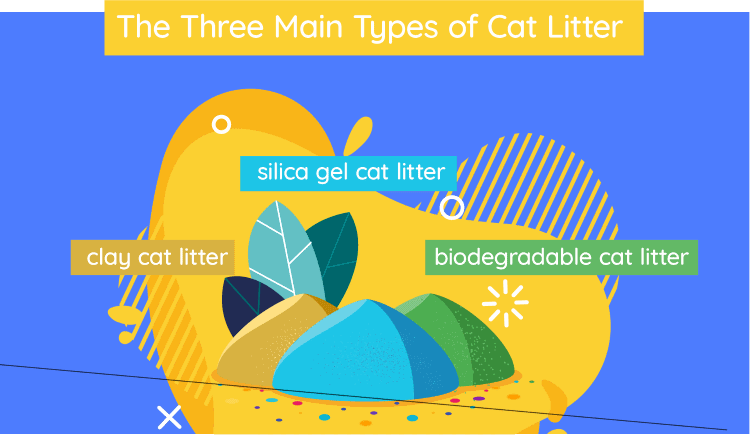 Let’s break the marketplace down into three fundamental types: clay, silica gel, and biodegradable cat litter products. Clay cat litter is by far the most popular type on the market today. It’s the most widely-available and most cost-effective, and cats usually prefer it to any other type. Despite its popularity, clay litter has its flaws and its critics. Because it’s gathered through strip mining and is non-biodegradable, its environmental impact has been described as an “absolute catastrophe”. Concerningly, clay contains crystalline silica particles, which are known carcinogens. Clay is the dustiest type of litter on the market. Considering that clay contains crystalline silica particles, it’s dangerous to inhale clay cat litter dust. 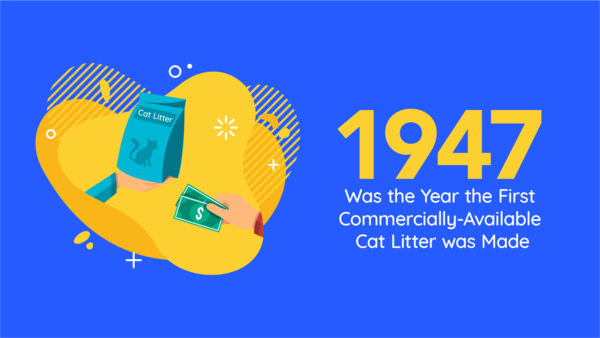 Non-clumping clay was the original commercial litter box filler and was first sold in 1947 as “Kitty Litter”. It’s made from a variety of absorbent clays, including sepiolite, attapulgite, and montmorillonite. These clays are used in industrial applications to clean up spills and can even dehydrate flowers. This litter does everything you’d expect a non-clumping clay litter to do. It absorbs moisture and controls odors. The product is marketed for its extended-release deodorizing that keeps the litter box smelling fresh 24/7. According to Tidy Cats, it’s 99.6% dust free. Clumping clay litter is usually made from sodium bentonite clay. This type of clay expands 12-15 times its original size when wet. This swelling ability causes it to clump in contact with urine, making it easy to scoop. 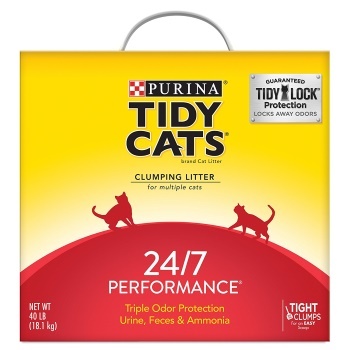 This is a simple, straightforward, no-frills clumping clay litter that is consistently ranked among the best products on the market. It clumps exceptionally well, helping to make box maintenance easy. The granules are on the large side, helping to keep them tidily inside of the box. Reviewers note that it’s less dusty than most other clay products. Crystal or silica gel litter is a relatively new addition to the cat litter shelf. It’s a low-maintenance litter made from the same gel crystals found in the desiccant packets that accompany some moisture-sensitive products. Silica gel crystals are made synthetically from silicon dioxide, oxygen, and water. Each crystal has millions of tiny pores that capture moisture. Instead of clumping, this type of litter dehydrates solid waste and absorbs liquids. If you remove solid waste and stir the litter daily, crystal cat litter can effectively serve you for up to a month before disposal. Because this type of litter has such great longevity, it’s more expensive than clay and some biodegradable products. While the litter is safe and convenient, it’s not popular among cats. The crystals are often large and uncomfortable under their paws. This product from Petco store brand So Phresh combines the convenience of silica gel litter with the perks of traditional clay. Instead of large, harsh crystals, the litter consists of paw-friendly micro crystals. Unlike most silica gel products, this litter clumps, allowing you to scoop out liquid waste. It’s lightweight, fragrance-free, and doesn’t produce much dust. The most head-spinning part of the cat litter marketplace may be the natural and organic department. The conscious litter shopper may choose from such earth-friendly options as corn, wheat, coconut, grass, cassava, pine, cedar, paper, and walnut litter. This type of litter is made from the fibrous material of walnut shells. It has a dark color that makes tracking particularly noticeable on light-colored floors and may impede your ability to identify waste in the box. It’s available in both clumping and non-clumping varieties. Grass litter is lightweight, but it has strong clumping and odor control abilities. Because it’s so light, grass litter tends to track and scatter. Possibly the most popular type of biodegradable litter, corn litter is made from compressed corn and may incorporate other ingredients to enhance its clumping and deodorizing power. Corn litter is relatively dusty and tends to track. Concerningly, corn is a top target for aflatoxin mold contamination. For this reason, it’s doubly important to keep the litter box clean when using corn cat litter. Paper litter is available in both clumping and non-clumping varieties. Pellet-style paper litter is most common. It’s made from highly-absorbent recycled newspaper and other paper products. Because it’s gentle on paws and doesn’t create dust, this type of litter is often recommended to sensitive cats or those with healing stitches. This type of litter is among the worst where odor control is concerned. Wood litter may be either clumping or non-clumping. It harnesses the absorbency and natural odor control ability of dehydrated wood fibers. Tracking, scattering, and dust vary depending on which type of wood litter you choose. This type of litter utilizes the odor-controlling enzymes and clumping starches naturally found in wheat. Wheat creates soft clumps and may be dusty. Click here for a list of the best natural cat litter. This star clumper is 100% sorghum grass. It has a soft, lightweight body that cats like to dig in. While the texture is paw-friendly and the weight is easy on your back, prepare for some tracking and scattering. This is one litter that demands a good litter mat. Unlike some other biodegradable products that lack muscle, this product creates excellent clumps and most reviewers state that it does a good job of controlling odors. SmartCat’s biggest flaw is its price. Most natural and biodegradable products are on the expensive side, and this litter is one of the priciest. If you’re looking for a lower-priced alternative, try grass litter from Frisco. You’ve done everything right. You scoop the litter box every day. You empty it completely every couple of weeks. You provide multiple boxes throughout the house. But your efforts have done nothing to stop the stench. In this case, it’s probably time to switch to a new litter. Clumping clay, pine pellets, and silica gel products score particularly well in smell tests. Some products are infused with ingredients that either neutralize or disguise odors. The neutralizing category usually involves activated charcoal or baking soda. The other category employs perfume to cover up natural odors. Some people like their cat litter to smell like air freshener, but from your cat’s perspective, these added fragrances are probably overwhelming and not at all pleasant. Click here for a list of the best litter for odor control. 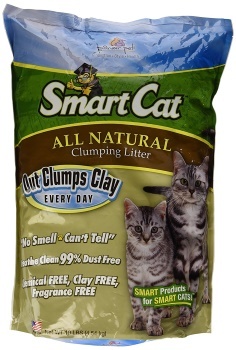 This clumping clay litter has a full kit of odor-neutralizing features. The odor control system includes three agents. The first is activated charcoal to capture ammonia and feces odors, followed by an antimicrobial to stop bacteria growth, and plant extracts that, according to Ever Clean, eliminate any residual odors. It neutralizes odors without attempting to disguise them, so you don’t need to worry about any irritating fragrances. Just as it can clog the pipes in your house, clumping cat litter may block your kitten’s delicate plumbing. While all cats face a risk of intestinal blockage from litter consumption, kittens are a uniquely high-risk group. Kittens are curious, playful creatures with a tendency to consume bits of litter. A teaspoon of litter could expand to ⅓ cup in your kitten’s tiny body. Similarly, some adult cats eat litter due to nutritional deficiencies, leading to constipation, diarrhea, and intestinal pain. Any cat with a tendency to ingest litter should avoid clumping products. Click here for a list of the best cat litter for kittens. This litter doesn’t clump, so you don’t have to worry about it forming an insoluble mass in your kitten’s intestinal tract. Additionally, paper litter is soft under your kitten’s baby-soft toes. It’s dust-free, made without any added fragrances, and completely biodegradable. On the negative side, this paper litter doesn’t provide the best odor control, so you’ll want to change it at least once every week. What’s the best cat litter for declawed cats? Our conversation about the barbarism of declawing often omits a devastating complication. Cats are prone to litter box problems after declawing. In the days after the operation, using the litter box is painful on their tender toes. And further down the recovery road, declawed cats continue to struggle with the pain. Because using the litter box can be particularly painful, declawed cats may avoid the gravel and plastic and opt for something soft that doesn’t press at the site of mutilation. Litter box avoidance is a tremendous problem. Ironically, this operation intended to make cats more house-friendly may ultimately send them back to the shelter. Veterinarians often recommend paper litter for any cat recovering from an operation. The tender touch of this extra-soft litter is gentle on declawed paws. Recycled paper is virtually dust-free and won’t contaminate the wounds. 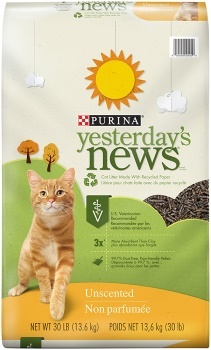 Another good quality of Yesterday’s News is the fact that it is a non-clumping pellet litter. Cats who have recently been declawed should avoid clumping litter; clumping products could stick in their paws, leading to pain and possible infection. What’s the best cat litter for multiple cats? The best cat litter for multiple cats is identical to the best litter for single cats. If a cat litter line includes a multi-cat formula and a standard formula, choose the multi-cat formula. Good multi-cat formulas create firmer clumps and control odors better than do their standard litter counterparts. Whether you have one cat or twelve, extra strength is always a good thing. Additional feline household members demand changes in your cats’ bathroom arrangement. You’ll want to add new litter boxes and use strategic positioning to ensure that they don’t become central to territorial spats. Click here for a list of the best cat litter for multiple cats. 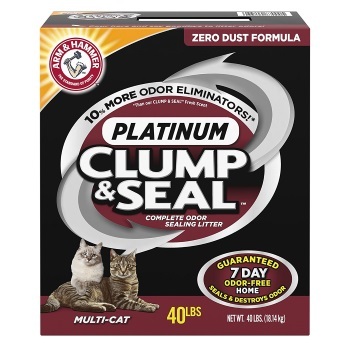 Considered Arm & Hammer’s “platinum formula”, this litter is made with a patented formula designed to neutralize and seal odors on contact. Arm & Hammer guarantees that this litter will eliminate odors for seven days. Thanks to plant-derived clumping agents, the product creates firm, scoopable clumps. It’s described as a 100% dust-free formula, and most customer reviews agree that it produces considerably less dust than the average clay litter. 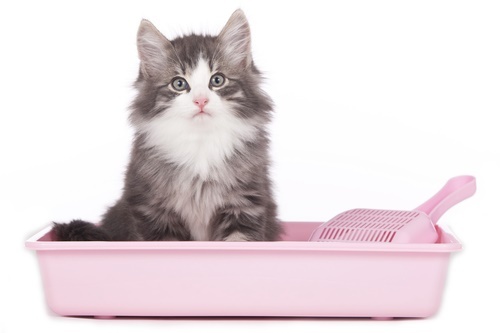 What is the best flushable cat litter? You flush your own waste down the toilet, so why not do the same with your cat’s? Instead of storing bags full of cat waste in your house, you can flush it all away. It’s a fresh concept. The only problem with flushable litter is that it doesn’t always work. In theory, flushable cat litter is any product that will pass through your plumbing without clogging it. A truly safe-to-flush litter is compatible with your system. Older plumbing is more susceptible to clogs. Even flushable litter can be risky, so it’s always recommended that you flush gradually rather than dumping a boxful of litter into the toilet. Allow the clumps to dissolve before touching the flush lever. Remember to check with local ordinances before flushing cat litter. Flushing litter is illegal in some areas, primarily due to the fact that soiled litter often carries Toxoplasma gondii parasites. Cats shed the parasites in their feces, and while most cats are asymptomatic carriers, the parasite can be deadly to other animals. The parasite is resilient. Water treatment systems cannot destroy it before it travels into environments where it can harm sensitive populations. This biodegradable litter consists of a combination of corn and cassava. It performs well in almost all key areas, including clumping, odor control, and dust production. Additionally, it’s advertised as a flushable product. As always, you should be prudent and consider your unique plumbing situation before flushing. What’s the best lightweight cat litter? Schlepping a 40-lb bag of cat litter from the car to the house can strain your back and make you loath to buy litter again. Because we use litter by volume, back strain and litter quantity aren’t always directly proportional. Clay litter is by far the heaviest type of litter. If you want lightweight clay, you’ll need to seek out a specially-formulated product. Most other litters, including silica gel and biodegradable products, are lightweight and easy to transport. 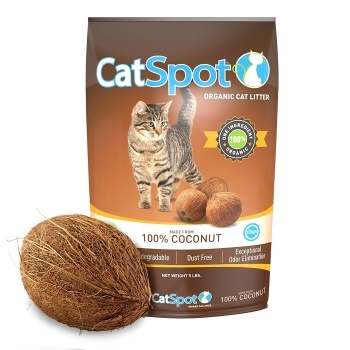 This natural litter is made from coconut husks (also known as coconut coir), and it’s feather light. Five pounds of this product are as absorbent and long-lasting as twenty pounds of clay litter. In addition to helping you breathe easily while carrying litter up the stairs, CatSpot litter is virtually dust-free. It’s a non-clumping product, so you’ll need to scoop out feces and give the litter a stir each day to ensure even urine distribution and absorption. Because the litter is so light, scattering and tracking can be problematic. 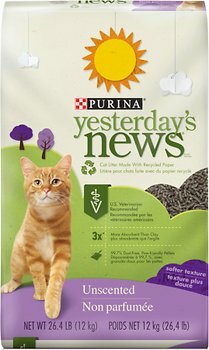 What’s the best non-tracking cat litter? Tracking is inevitable, but you can minimize it by using the right products. Small, lightweight litter particles stick in your cat’s paws and are easily tossed out of the box. Opt for weightier granules that will stay in place. This litter system takes a unique approach to cat litter. 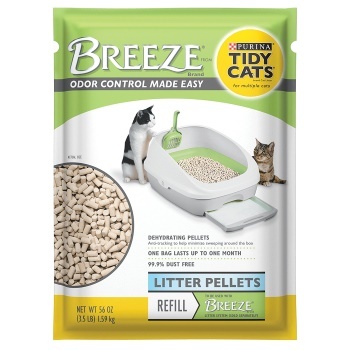 It combines a litter tray, absorbent pads, and deodorizing clay pellets to make litter box maintenance extraordinarily simple. The pellets are placed on a tray over an absorbent pad, allowing liquid waste to drop onto the pad. Solid waste remains in the odor-neutralizing pellets. The heavy clay pellets seldom cling to your cat’s fur or paws, so tracking is minimal. What’s the best non-clumping cat litter? Because it isn’t scooped daily, non-clumping litter has to perform excellently in all areas. Chiefly, non-clumping litter has to be incredibly absorbent, ensuring that the litter box stays dry and comfortable. Secondly, it must possess stellar odor control abilities. Click here for a guide to choosing the best non-clumping cat litter. 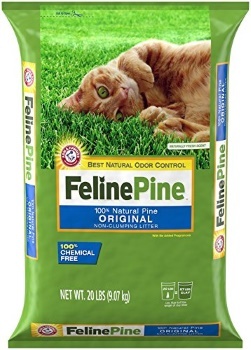 Feline Pine is made from dehydrated pine pellets, which are naturally absorbent. In most cases, the pellets can withstand considerable use before they become saturated and smelly. That means that you can safely change out the litter box as infrequently as once every two weeks. When these pellets are moistened, they disintegrate and revert to sawdust. You can filter the sawdust out while scooping or simply dump out the box when all of the litter has reverted to dust. Pine provides phenomenal odor control and smells great by human standards. Because it is a pellet litter, Feline Pine doesn’t appeal to every human or every cat. Pellets can be uncomfortable under your cat’s paws. What’s the best dust-free cat litter? If you’re serious about choosing a dust-free litter, forget about clay. 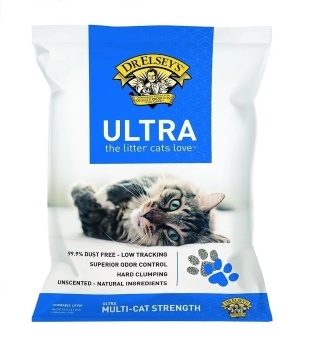 While some clay litter is better than others – Dr. Elsey’s Precious Cat is consistently ranked as one of the least dusty clay products – people and cats with severe dust sensitivities will need to seek out a non-clay litter. Silica gel litter produces minimal dust, so it’s sometimes a good choice for sensitive systems. In the natural and biodegradable space, you’ll need to refine your search to eliminate certain allergy triggers. If your cat has respiratory problems, you may choose to avoid corn, wheat, and pine litter. All of these can exacerbate allergy-related respiratory irritation. Walnut, grass, and paper litter, however, produce incredibly small amounts of dust. Click here for a list of the best dust-free cat litter. 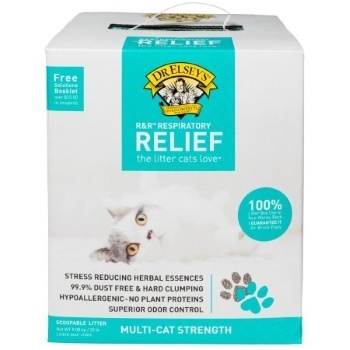 This silica litter is hypoallergenic with no plant proteins, is essentially dust-free, and is infused with stress-relieving herbal essences. Like most silica crystal litter products, this is not a clumping litter. Instead, you’ll scoop out any solid waste and stir in any urine. The silica gel litter can withstand up to a month of use before you’ll need to dump it out. Underscore this point: the best cat litter is the litter your cat wants to use. Cats like fine-grained litter and they usually dislike anything that’s lumpy under their delicate paws, making pellets and crystals less popular choices. Try to select products with a fine, comfortable texture resembling nature’s litter box. Remember that some cats don’t like change and are resistant to the idea of switching to a new litter product. Gradually switch to the new litter over the course of a week or more. Alternatively, use the new litter in one box and your cat’s old litter in another, allowing your cat to make the change independently.